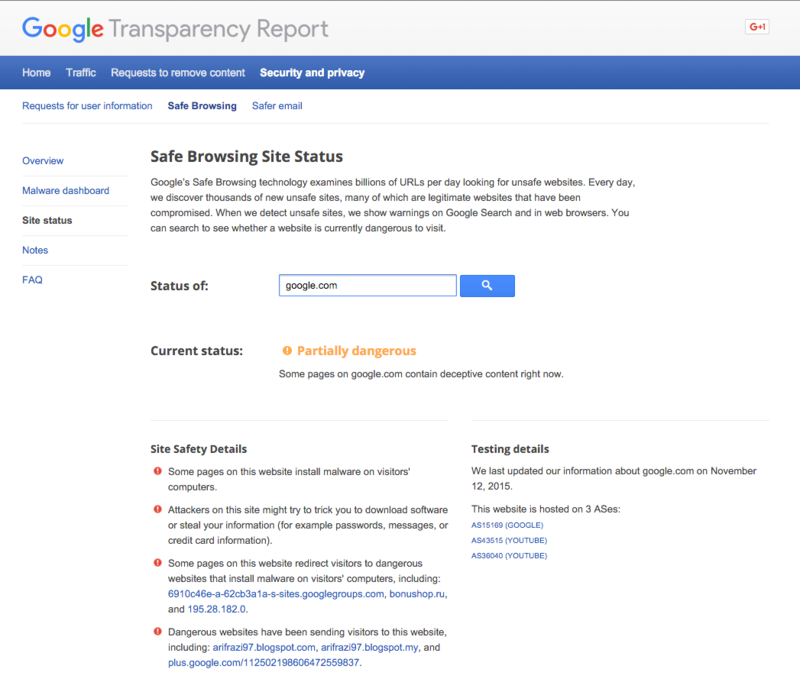 A few weeks ago Google announced a rebound to a tool to test to see if a site is safe to browse or not. It is the Safe Browsing Site Status tool. You can plug in any web site and Google will give you the status of the site. But according to the tool, Google.com is a dangerous place to browse. According to the tool, Google.com is "partially dangerous" while "some pages on google.com contain deceptive content right now." Some pages on this website redirect visitors to dangerous websites that install malware on visitors' computers, including: 6910c46e-a-62cb3a1a-s-sites.googlegroups.com, bonushop.ru, and 195.28.182.0. Dangerous websites have been sending visitors to this website, including: arifrazi97.blogspot.com, arifrazi97.blogspot.my, and plus.google.com/112502198606472559837.